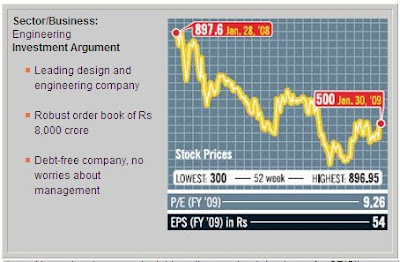 This is the second most visited and read article on Indian Stocks News in year 2009 till now. I feel it is important to visit back to this list of best stocks to buy as I strongly believe we are soon going to see a moderate to big size correction in stock markets. We should be ready with cash to buy stocks which have intrinsic value and growth prospects. 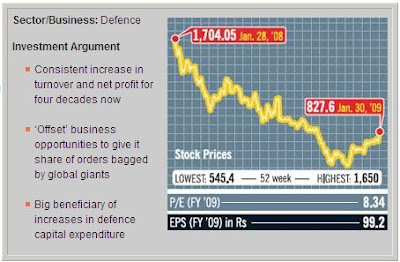 Business Today magazine had recently published a list of top stocks to buy or watch out for in 2009. One may treat these as buy stocks advice, strictly for long term investment. Mentioned here are best stocks that are strong to survive the slowdown in 2009. Buying stocks which could emerge as best performing stocks to buy out of this gloom would help you in strengthening your portfolio in long term duration. They are very cheap stocks in terms of value stock investing for long term valuations. The list is in alphebetical order. Business Today had spoken to 11 of the brightest minds on Dalal Street and got them to identify their favourite long-term value picks. For some time now, smart money has been moving into shares of multinational pharmaceuticals companies. 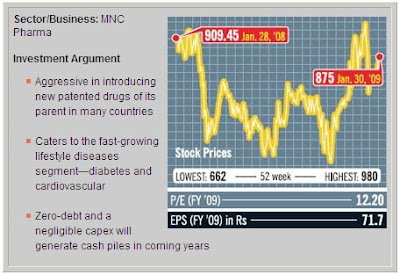 After India entered the product patent regime in 2005, the fortunes of MNC pharma companies have changed for the better. They can now introduce new blockbuster drugs of their foreign parents and enjoy the profits. Aventis Pharma is one such well-placed MNC. It is focussing on fast-growing lifestyle segments like cardiovascular and diabetes in the domestic market. Aventis has a few strong products in this segment like Amaryl (anti-diabetes) with a 4 per cent market share and Cardace (cardiovascular segment) with a 28 per cent market share. Besides, its parent Sanofi-Aventis, France, has a huge pipeline of molecules under development in the lifestyle category. The stock market often reacts sharply to news from the banking sector. Axis Bank’s stock dipped sharply—slipping nearly 18 per cent to Rs 394.50 on January 27, 2009, down from Rs 485 on January 9, 2009. The market, already edgy over slowdown fears, was more worried over the retirement of Axis Bank’s long-time chairman P.J. Nayak, and the issue of a successor. 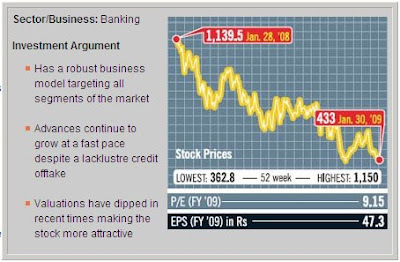 Axis Bank’s advances continue to grow at a decent clip of over 50 per cent at a time when credit expansion has slumped. Everybody wants light in dark times—and BHEL has the spark. Bharat heavy electricals, the largest manufacturer of power plant equipment, is one company that is unlikely to be hit by the economic gloom. It knows the government will spend freely to improve the power sector. And the government does not cancel orders. So, BHEL, which has 64 per cent of the power plant market, has been ramping up capacity. By December 2007, it had increased capacity from 6,000 MW a year to 10,000 MW, and is now taking it to 20,000 MW by 2011-12. 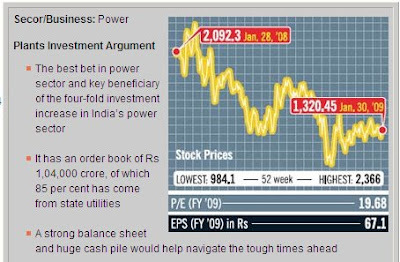 Says Pulkit Bakliwal, analyst at Sharekhan: “The 11th Five-Year Plan has envisaged capacity addition of 78,000 MW. BHEL has been the major beneficiary of the spending.” Government projects account for around 85 per cent of BHEL’s order book of Rs 1,04,000 crore, giving it high revenue stability. “Even in the present scenario, orders placed by government institutions are unlikely to get cancelled,” says Bakliwal, pointing out that the cash-strapped private players may have to do so. “This gives BHEL a huge comfort level,” Bakliwal adds. The global credit crisis has hit the capital-raising plans of Indian companies.The only window open these days is through domestic debt issues or bank borrowings. 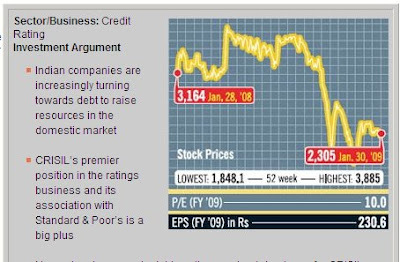 Here’s where a debt rating from CRISIL, India’s largest rating agency, helps. Another growth avenue has been created by the Basel-II norms to rate corporate loans given by banks. Says Jigar Valia of Parag Parikh Financial Advisory Services (PPFAS): “It’s a small component now, but it’s going to be a phenomenally fast-growing business. It’s a perpetual and stable income.” CRISIL’s work for its parent Standard & Poor’s is a cash cow. One of Asia’s leading design and engineering companies, Engineers India builds petroleum refineries, industrial projects, offshore structures, metallurgy and power projects. India’s substantial investments in infrastructure have given it an order book of Rs 8,000 crore, to be executed over 3-4 years. It has begun protecting its margins by signing open-book orders—input cost hikes are passed through. The share price of Gujarat Mineral Development Corporation was one of the worst affected when Gujarat government asked state-run companies to fork out 30 per cent of their profit before tax for social work. Despite this, the stock is still seen as a good value pick—the bad news has been discounted. 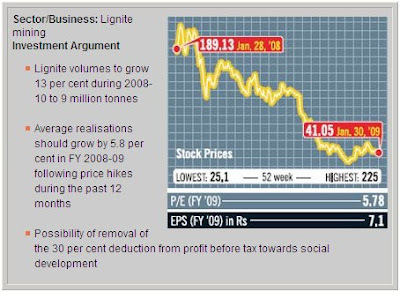 Profitability is expected to get a boost from the recent lignite price hike. “Full impact will be seen in the next financial year,” says Sameer Ranade, analyst at PINC Research. The government may reverse the 30 per cent rule, since minority shareholders at some other companies have mutinied. GMDC’s moves into the power sector will add to valuation. 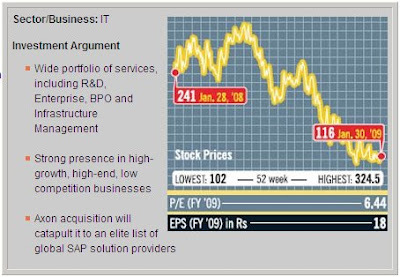 As India’s fifth-largest IT services exporter, straddling a diverse portfolio of services that ranges from R&D to enterprise, BPO and infrastructure management, HCL Technologies has a de-risked model as it is essentially in high-growth, high-end, low competition areas. It is looking at inorganic growth. At a time when the home loans business is in the dumps, a lower third-quarter profit at India’s largest housingfinance company did not ring any alarm bells. 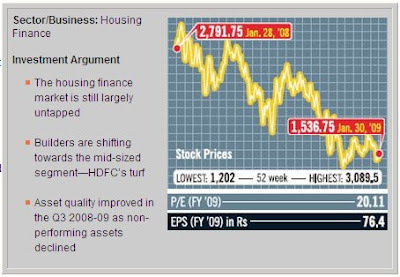 Housing Development Finance Corporation actually boosted net interest income by 18 per cent to Rs 785 crore but was hit by higher running expenses. Analysts did not waver from their “buy” rating. 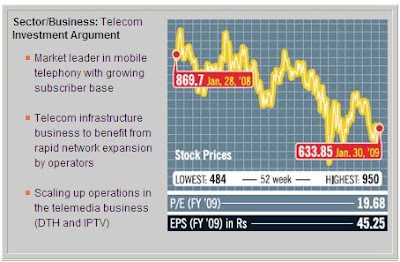 I enjoy your informative charts and analysis and believe India has a shining future. I know one stock in the U.S. that I can purchase, IGC. Is there a list of Indian stocks listed on US Markets that a US citizen can invest in? Does anyone publish analysis of those stocks? Thank you in advance for your assistance and please continue your good work.